Premium resources made with love just for you. I make resources to help writers just like you conquer their writing lives and master craft, because I believe you deserve to be a happy and productive writer. ALL THESE RESOURCES ARE Made with love. Just for you. Always. So, grab a workbook, take a class, and be the Real+Good Writer you're meant to be. Join the Facebook group of Real+Good Writers! This is the exclusive community for writers who want to write stories with authenticity and excellence, live a balanced writing life, and change the world with words. This is for the literary fiction writers, the late-night novelists, the writers-with-a-day-job, the writerpreneurs, the dreamers, and the world-changers. We write because we seek to understand ourselves. We write because we hope to capture the world around us. We write because stories deserve to be told. We are Real+Good Writers, and we write. Join us for free! Inspire yourself by claiming your identity as a writer. Discover what it means to be a Real+Good Writer in the manifesto that explains who we are, what we do, and why we write. If this sounds like the writing life you want to live, join us in the Facebook club! Get the insider scoop on my favorite resources for writers from around the web. Find online courses to amazing writing blogs, and my personal list of required reading. When you know yourself and free your writing from the chains of "should," you write the stories only you can write. Discover yourself and your unique Writer's DNA in this online class. Balancing writing and the rest of your life can be tough, but The WriteLife Planner is here to help. In 3 short months, you will conquer your writing goals, strengthen your writing practice, and start to live a writing life you love. 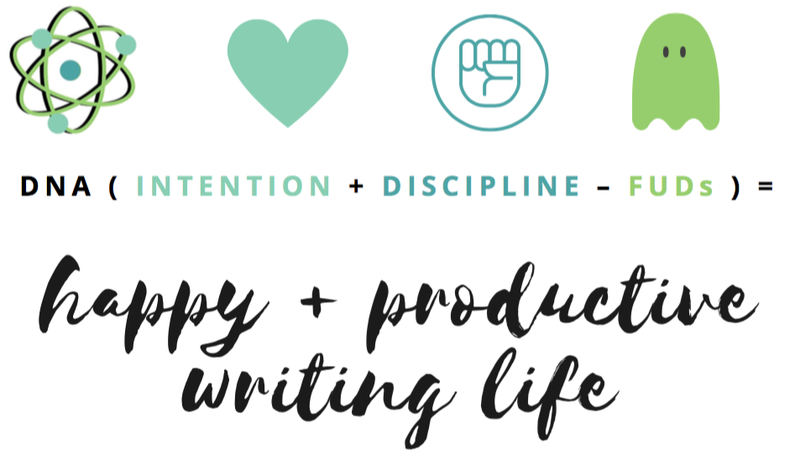 Through learning how to focus your intentions, master discipline, and conquer your fears, uncertainties, and doubts, all through your unique Writer's DNA, you create a writing life you love. This is the ultimate Mindset Masterclass to create a writing life you love. *This course was previously run as "The Writer's Brain". A new and improved version is currently in the works. Stay tuned for more info! I write articles on craft, drafts, the business of writing, the writing life, mindset, and my own personal writing journey. Many of my blog posts have free worksheets that help you apply the concepts right to your own writing. Grab a cup of coffee and dive in! I've been writing articles for the Real+Good Writing blog for two years now, and there's a lot of posts! Here are my personal favorites. The WriteLife and WriteMind category is all about various issues that may arise in your writing life. We conquer your writer's brain so you love your writing, get the stories onto the page, and cultivate a writing life full of passion, wonder, and joy. Because you can live a Real+Good Writing Life. The Craft+Draft category is all about learning and practicing techniques to bring back to the page. We sharpen your skills so you can write beautifully. We study novels, short stories, memoirs, essays, and other story forms that teach us how to speak to readers and change the world. We demystify the "how did they do that" from process to craft. Because you can write Real+Good Stories. The Authopreneurship category is all about the business of writing. We treat writing as our career so you can connect with readers who love your words. We work hard on the business of writing: publishing, marketing, branding, and money. Because you can be a Real+Good Write-Boss.